How hard would you work to communicate? Joey’s AAC devi ce was returned a few weeks ago, much to my delight . Almost immediately he became his old chatterbox self, sharing his observations, thoughts, comments, and desires. It was so nice to hear Joey’s inner voice and thoughts again. Sadly, it didn’t take long for the device to start slowing down just like it did back in November. 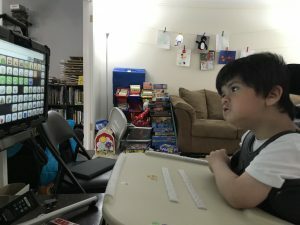 Joey went from using his device accurately, quickly, and in socially appropriate ways, to slowly and laboriously attempting to choose a word – only to have the machine not respond to his eye gaze. It is painful to ask Joey a question and then wait while he stares at the device, attempting to select the word he wants. When there is no response his initial efforts, he tilts his head, smiles, looks away, changes his position, or even giggles. It is as though he is actively attempting to persuade the device to select his word through his social skills. Joey is working so hard, with such a limited reward. It seems almost cruel to ask him to use it with this delay, yet it also seems cruel to take it away from him and leave him without a vocabulary. So we wait, patiently, while he selects his word, or attempts to select it, again and again. At times, when I can tell what he wants to say, especially if he’s made numerous attempts, I’ll go ahead and select it for him because it is not his fault the machine is not responding. I don’t know many five year olds who would be quite this persistent with choosing their words. Come to think of it, I don’t know adults who would persist with such a frustrating task. This is such a powerful reminder of how much Joey values communication and having access to his words, while also serving as a witness to Joey’s strength and persistence. I just wish we could magically fix it for him, or make it easier in some way. I understand there are set plans to fix the problem and not leave him without a way to communicate while it is being fixed, so hopefully we’ll have him back in action soon. 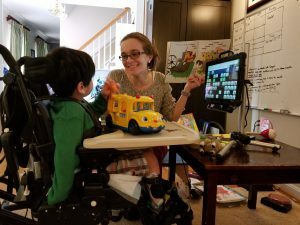 Joey’s AAC device is back! It’s wonderful to be able to hear his ideas and thoughts again. When we were reading Click, Clack, Surprise, he used it to tell me that the messy little duck needed a mirror. In the midst of a book he said “Wish Grandpa”. I asked “Where is Grandpa?” and he responded, “Couch” before looking at the couch, turning back to his device and saying “none” since there was no grandpa on the couch. My favorite may have been when he said “Bite” before putting a toy into his mouth and eating it. I love that he is back to being able to express his wishes, share his observations (the duck really did need a mirror), and be silly with his vocabulary. However, having this transition from no words to having words also lets me reflect on how much harder it is to actually work with a child who can express themselves. When Joey’s words were out for repair, he was a eager participant. I could fill our hour long sessions with my own words, and I controlled when Joey participated. Because Joey is eager to learn and be active, these sessions were great. He sat patiently and waited for me to get out the materials that would let him make a choice. He didn’t interrupt me to ask me to stop reading so he could move toys on his tray into the right position. He didn’t interrupt to share ideas about the duck needing a mirror, or randomly start talking about dinosaurs in the middle of a book. He didn’t tell jokes or try out new words in the midst of our lessons. As a teacher, it was easier, but that doesn’t mean it was better. In teaching, we always have to remember that it’s not about us, or efficiency, our plans, or our comfort. Which is hard, frustrating, and can require self-reflection. With his words back Joey is able to talk like a typical five year old. He can interrupt, attempt to change the topic, be silly, tell jokes, or completely ignore the adult talking to him. With a typical five year old we can’t just turn off their voice. We have to use strategies to help them stay on task. And a typical five year old has a lot more power of words than Joey does, because they can talk faster or raise their voice to express their emotion. Joey’s auditory output on the device remains at a neutral tone, and his rate of speech depends on how fast he can find his words. It’s tempting to interrupt Joey while he talks and erase the words on his screen that are distracting him from our work. It’s a simple push of a button to move from the off-topic dinosaur page back to the main screen. But of course, typical five year olds don’t have screens we can move them away from. And yet, there is even a balance here, because if I stop Joey’s additions to our lessons all the time, I’ll never know that he wanted to share that the duck needed a mirror, that a character was making bad choices, or that he suddenly is wondering where his grandfather went. I find myself giving him time to compose his thoughts – off topic or not – before bringing him back to our book. It’s more important for him to practice putting his ideas into the world through his device than it is to be on topic all the time. I easily could stop his ideas before they start, and yet that feels like it isn’t honoring Joey’s thought process. He needs to learn to stay on topic and honor the conversation in front of him, but sometimes the best way to learn this is to get off topic and then be brought back. Having the device back reminded me of how essential access to communication is, as well as how much responsibility it puts on us teachers to move from delivering lessons to reflecting on our roles as communication partners. Early this fall we recognized that as Joey’s communication was increasing, his types of communication were increasing as well. We began taking data on how often he made demands, made social overtures, shared observations about his world. 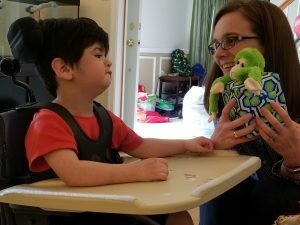 Joey’s AAC device was sent for repairs before winter break, and unfortunately he is still without his AAC words. While this is frustrating for many reasons, it gives us a chance to see what Joey’s communication is like without the device. 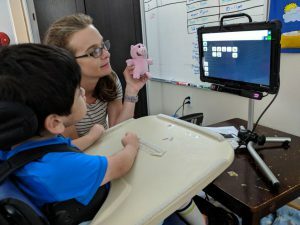 In October, before his device began to malfunction, Joey showed an average of 29.62 words on his AAC device in a ten minute period, and an average of 2.3 verbal utterances with the purpose to communicate during the same ten minute window. In an hour long session Joey used an average of 3.6 multi-word phrases. In October the majority of Joey’s communication was to make social observations, explore words on his device, and to make demands. He also frequently used his device to participate in social exchanges and to respond to questions. Without the device his verbal utterances have increased, and he may use a verbal utterance to communicate 5.3 times during a ten minute period. Although this is a small increase in verbal utterances, it is a significant decrease in his ability to participate and communicate. When Joey is relying on verbal and gestural cues to communicate, most of his communication attempts are to respond to a question, or make a demand. His typical pattern of drawing my attention to something he likes on a page, sharing his thinking, or participating in a social exchange has almost disappeared. There are times he attempts to engage me socially, as well as to show me something particular, but these have decreased when he does not have his robust vocabulary to support him. I have observed that Joey is more likely to participate verbally during a story if I pause during a repeated line and allow him to fill in the blank. I’ve changed my interactions and questioning a bit to give Joey the opportunity to participate in different ways, which has also increased his verbal utterances during this ten minute period. Reviewing this data shows me that Joey is a dynamic, engaged child who is determined to participate and communicate any way he can. 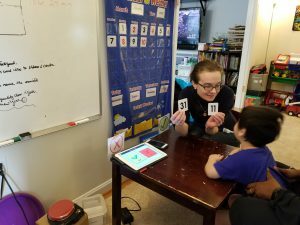 However, when given access to his AAC device he is able to share his thinking and participate in more appropriate social interactions. Without his device he is limited to expressing just the initial sounds of words, familiar words like “up”, and using gestures to interact with his world. As I was writing this post I received a text that Joey’s AAC device is back!